This is a festival. A celebration. And as with any good party, there will be lots of things going on. So your first mission is to choose exactly what kind of celebration you are going to make of it. What are you going to do? You can make a full multiday challenge by running in every possible event, choose to run every day but not in everything, pick and mix a few different distances across the three days. o just elect your fave distance and keep it at that. You will take on the Marathon on Sunday, back up with the Donna Double and the night run on Sunday, plus the Lilo Dash ‘n Derby. Single entry to this event. One surf lilo, you get to keep of course! We'll just organise it for you. SO WHAT TICKET-TO-RUN WILL YOU LOCK IN? Yep, a shebanger tee fit for a trail running lumberjack. You want one. So enter BEFORE January 12th to score one for nix. RRP$30, so it's a damn good cop. Applies to Multiday Madness and Lumberjack Run registrations only. OTHER DISTANCE REGISTRANTS CAN PRE-ORDER. We will only be doing a short run of these (we're sick of left over tees in our cupboard! ), so if you want one, order or you may miss out!!! NOTE: COLOURWAY (AND DATE) WILL CHANGE FOR 2019! Yep, you can. Easily. But you have to love beer enough to have ALREADY ENTERED SHARPY'S BEER RUN, which takes place the weekend after Warburton Trail Fest on Saturday 16th March on the Mornington Peninsula. We'll be there ... (the Warby RD will be your beer o'clock MC)! We're big fans of Sharpy. And of beer. And of running. And by heck we didn't want the Fest to impact at all on people choosing to run in Sharpy's. So we concocted this brilliant plan where everybody wins. Give anyone who has already entered Sharpy's a massive discount. Because we want you at the Fest AND at Sharpy's. 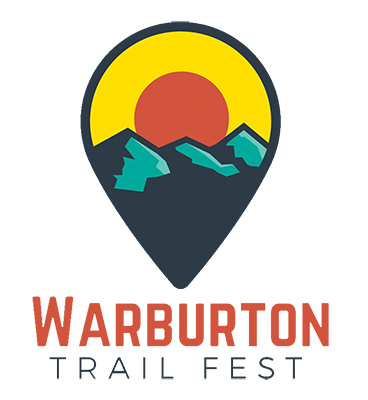 Sooo - enter Sharpy's and she'll supply you with a special discount code to THEN enter the Warburton Trail Fest at 20% discount. For Multiday Madness, that's like a $47 discount! To qualify for Multiday Madness 'King/Queen of the Trails' and/or the Multiday Medal, you MUST complete all the allocated races including the Lilo Derby as mandatory. Non-completion means you will not get a Multiday Madness medal. PROTECTIVE HELMETS ARE MANDATORY (bike helmets okay). No-one will be allowed on the river without a helmet. We recommend (but not mandatory at this stage) Personal Flotation jackets, too. The more you float, the faster you go. SHOES / FOOTWEAR ARE MANDATORY. It's rocky underfoot, you'll have to stand at times and we don't want punctured feet! And you have to run to the start of the lilo leg anyway. LILOS can be purchased as part of registration OR you can BYO. LILOS will be collected prior to race start on Monday morning. We will transport them to the start of the lilo leg (you will run to that location from the Football Oval). CHILDREN UNDER THE AGE OF 12 must be accompanied by a supervising adult. In summary, you must have a lilo, shoes and a helmet. It is mandatory to have a headlamp on this as it is a night run. No headlamp, no run. There are Mandatory items for other runs. Please check the requirements in FAQs. Will only be given if requested in writing three weeks prior to the event (16th February 2018), there are no exceptions, even if you have a medical certificate and sob story! Please don't request a refund post that date, as refusal seems to offend. This is part of the agreement in registering. Reason is that most of your fee has already been spent on logistics (bibs ordered, food purchased, permit number included, etc). Standard event operating conditions. Refunds prior to the date will be less a small administration fee. If you are entering multiple runs (but not the Multiday Madness) we ask that you just take a medal for one of your events (you can take more if you want, but hey, they'll be the same medal!). TRANSPORT FOR THE LUMBERJACK RUN – OWN CAR OR BUS? The start of the 50km Lumberjack Run is located in Powelltown, a village approx 30 minutes drive from Warburton. You can arrange your own transport / car shuffle, or you can BOOK and PAY for a bus when you register online. Only those booked and paid will be able to catch the bus, which will leave from Warburton Football Oval an hour prior to the allocated start time of the run.